B.U. Bridge is published by the Boston University Office of University Relations. Many devices we use every day -- pencil sharpeners, traffic lights, clothes dryers, typewriters, and elevators -- have one thing in common. They were invented by black people. These scientists and inventors, who overcame enormous barriers to enhance the quality of life for millions, were honored January 25 at an exhibition at the George Sherman Union's Ziskind Lounge. The Black Inventors Exhibit, complete with videos, personal letters, and rare photos, was sponsored by BU's Minority Engineers Society (MES), a chapter of the National Society of Black Engineers. "The exhibition is a way of letting people know how much of an impact black people have had on the building of America," says Damion Shaw (ENG'02), the programming manager for MES. "These are inventors that you don't read about in history class." To be sure, many are familiar with George Washington Carver. But most don't know about the obstacles he hurdled, including slavery, poverty, and a bout of whooping cough that almost killed him. And although Carver is credited with inventing peanut butter, in 1896, a more substantial contribution was developing a system of crop rotation that replenished minerals in the soil. "Carver almost single-handedly changed the South's economy," says James Ince, executive director of the exhibition. "After his work, farmers were making more money growing peanuts than harvesting cotton." The exhibition also includes modern-day black inventors who have been overlooked by history. For example, the name Emeagwali probably doesn't ring a bell with most people. But it should: Philip Emeagwali, who lived in a refugee camp during the civil war in Nigeria, went on to invent a formula in 1989 that allowed computers to make 3.1 billion calculations per second. Garrett Morgan. Two of his inventions, the automatic traffic signal (1923) and the gas mask (1912), are shown above. In between Carver and Emeagwali were dozens of significant inventions by black men and women: J. Standard's refrigerator (1891), T. George Grant's golf tee (1899), L. R. Johnson's bicycle frame (1899), Charles Drew's blood plasma bag (1945), Garrett Morgan's gas mask (1914), Henry T. Sampson's cellular car phone (1971), and the bane of many adults, Lonnie Johnson's supersoaker squirt gun (1988). "We first saw the exhibit last year at the annual convention for the National Society of Black Engineers in Charlotte, N.C.," says Shaw, "and we thought that this would be a great way to kick off Black History Month at BU." Some of these inventors were the sons and daughters of slaves: when the nation's capital was moved from Philadelphia to what is now Washington, D.C., Benjamin Banneker (1731-1806) drew up the plans for the layout of the city's streets, buildings, and monuments. 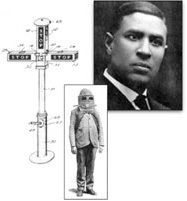 And Garrett A. Morgan designed a traffic signal in 1923 that greatly improved safety on America's streets. On July 24, 1916, however, he made national news by using a gas mask he had invented to rescue several men trapped during an explosion in a tunnel being dug beneath Lake Erie. Awarded a patent, he received requests from fire departments across the country to purchase the masks as well as a medal from the International Association of Fire Engineers. "His mask was refined for use by the U.S. Army during World War I," says Ince. "He was a successful inventor and businessman whose formal education never went beyond the eighth grade." Black people also invented the spark plug (Edmond Berger, 1839), the clothes dryer (G.T. Sampson, 1862), the rolling pin (John W. Reed, 1864), the fire extinguisher (T. J. Marshall, 1872), the stove (T. A. Carrington, 1876), the egg beater (Willie Johnson, 1884), the ironing board (Sarah Boone, 1887), the curtain rod (S. R. Scratton, 1889), the folding chair (Brody and Surgwar, 1889), the mop (Thomas W. Stewart, 1893), the lawn mower (L. A. Burr, 1889), the lawn sprinkler (Elijah McCoy, 1899), and the thermostat control (Frederick M. Jones, 1960). "The exhibit's amazing," says Beatrice Joseph (CGS'01). "These are products that we take for granted, and I had no idea who had invented them." Ince, who showcases the exhibition across the country at a variety of venues -- he likes to "transform inner city school gymnasiums into learning institutions" -- says that his goal is to educate young and old alike. "It's always great to go to a college and hear people say that they learned something from this exhibition," he says. "But it's especially gratifying to hear this from children. Minorities are traditionally underrepresented in the field of engineering, and one of my messages to these kids is that you can accomplish anything if you put your mind to it."